We've been blessed to have mission pastor Ralph Anderson, and his wife Joyce, at One Challenge for over 20 years. They tend to our souls through the Word, prayer, counsel, and encouragement. Each summer, they spend five weeks of ministry with our new mission appointees and veteran mission workers. In their pastoral care role, Ralph and Joyce come alongside these colleagues at different points in their lives and ministry journeys. During "normal" office hours, Ralph is at the U.S. One Challenge Mobilization Center in Colorado Springs, where he coordinates a weekly Monday morning chapel with speakers, worship leaders, and prayer time. As the OC family is spread all around the world, he does a lot to keep up with them, reading the monthly personal prayer letters of approximately 300 U.S.-sent mission workers and field reports from our teams who serve in approximately 43 different countries. 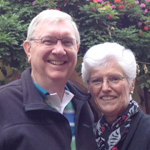 Ralph and Joyce also travel periodically to visit mission workers and their families in their areas of service around the world. Ralph says, "90 percent of pastoral care is just showing up. So, in all of the above and more, Joyce and I just want to “show up” for our people to encourage them and care for them in their personal and ministry journeys."